Note: This article is about why you should be eating raw fermented foods every day! Pus, find out what fermentation is and if it’s safe? My tummy was getting bigger. I could FEEL it, Every. Single. Day. And being that I am 54 years old, I knew I wasn't pregnant, even though I’m sure I looked it. Oh. My. Gosh....Perish the thought! Can you imagine how awful being P.G. would be at this age? Just saying! I am a grandmother and mother of four grown kids. Yeah. I'm kind of past those days. :-) But as I gazed down at my burgeoning tummy, I'm thinking to myself: What is going on here? Then I learned about how important it is to eat probiotics! You know: Those good little organisms that are supposed to help alleviate gut problems as well as improve our overall health. That’s when I started drinking and making kombucha—-a wonderful gateway to fermented foods. Then I learned about how GMO wheat and soy (used in just about everything these days) contributes to leaky gut and other problems. And....I just kept learning stuff about eating well. 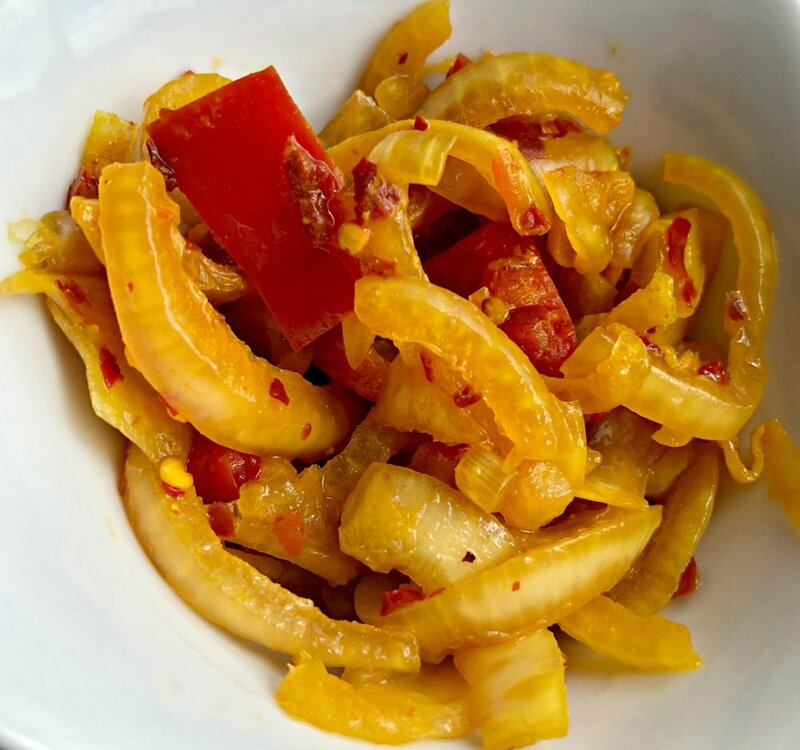 I especially found any information about fermented foods wonderful! If our body's bacteria are imbalanced, you can have too many bad bacteria living in your belly! These things cause extra inflammation in our organs, make our bodies work harder, and in general just cause us to feel crummy. I'm an action person, and I like results from the most natural sources possible. I also don't trust things that come in capsules, so I didn't want to go out and just buy dried up old probiotics. Then, through a friend of mine who drinks kombucha faithfully every day, I discovered fermentation. REAL fermentation: Not the fake processed stuff big business says is good for you (sugary yogurt, anyone? ), but real, true fermented foods! I've heard kombucha is the gateway for many people to other kinds of fermented foods, and that is what happened with me! I fell in love with fermentation. Making kombucha, lacto-fermented vegetables and fruits and beans, sour einkorn breads, kefir (dairy and water), herbal home brews, hard ciders, and kvass! I slowly started doing all of it! Get the newsletter and never miss a thing! Plus, you'll get access to the Self-Reliance Resource Library! How Does Eating a Variety of Fermented Foods Help Your Gut? Most fermented foods carry a great deal of nutritional value and are easily digested by our bodies. This is because fermentation is actually a process that "pre-digests" or breaks down foods, and this makes it easier for our bodies to assimilate nutrients! Fermentation also removes toxins, removes substances that are anti-nutrients to some extent, and actually generates additional good nutrients for us! Isn't that incredible? According to Sandor Katz, author of the "Bible" of Fermentation (just kidding--that's just what I call it), The Art of Fermentation, the primary health benefits of eating fermented foods include pre-digestion of food, nutritional enhancement, detoxification through changing anti-nutrients into usable nutrients, and the actions of live active bacteria (LAB) cultures. During fermentation, the bacteria and fungi have enzymes that break down the food. This change in the composition of the food is actually what preserves it naturally. Of all the methods of food preservation I employ, fermentation (to me) is the most exciting. The food is in its raw state, pre-digested and broken down in a way that is good for you and me! Even foods that are VERY difficult to break down, like beans and meats, are tenderized as the proteins are broken down by the fermentation process into digestible and useful amino acids by the action of the enzymes! You’ll love this fermented onion relish! It’s ready in just days, and it is SO good! "In the process of pre-digestion, many ferments accumulate increased levels of B vitamins," as well as other usable forms of nutrients not bio-available in pre-fermented foods. (Katz) To say this clearly, the process of fermentation actually CREATES more nutritional benefits for our bodies to use! Especially in the case of the all important B vitamins and those that help create energy, eating a variety of fermented foods every day can change your nutritional life! Even more lightweight toxins, like phytates found in grains and legumes, are considered anti-nutrients because they bind necessary minerals, making them unavailable for absorption in our bodies. And did you know, too, that fermentation has been a useful way over thousands of years to make toxic water safe? This happens when you add sugars that the bacteria will consume, allowing the release of small amounts of alcohol or acids that will kill the bad bacteria. Eating and drinking raw fermented foods and drinks like this Pineapple & Clove kombucha is one of the best gifts you can give your body. Hey, have you ever wanted to learn how to create your very own tea blends for pleasure or even for health purposes? Find out everything you need to know in my eBook! Just click the picture. Available on Amazon too! Fermented foods are just plain good for you, cooked or not. Take for example, sour dough breads, fermented porridges/oatmeals, and tempeh---these retain all three of the above benefits. But for this final benefit of Live Bacterial Cultures (LAB), the fermented food must be raw. This is where much of the hype of probiotics comes in! Fermented foods that are raw contain these natural LABs. Using probiotics has been linked to improving and healing diseases of the digestive tract, including constipation and diarrheas related to IBS, IBD, and HIV. Probiotics are clinically shown to relieve symptoms in patients with HIV and colon cancers. The bottom line, for me, is that these live cultures from real food probiotics are super great for our bodies. I've experienced the benefits myself! Real yogurts (especially if you make it yourself), sauerkrauts and other lacto-fermented foods, kombuchas, kefirs, raw cheeses, kvass, and home brews----all are wonderful, easy, and fun to make! This fermented tomato salsa is SO delicious, easy, and best of all----it's GREAT for you! The key word is: "Variety." Since there are many kinds of good bacteria, you need to eat different kinds of fermented foods in order to get the most benefit. Plain whole milk yogurt (the kind with about two ingredients only), raw sauerkraut, raw kimchi, any kind of raw lacto-fermented vegetable or fruit, and fermented drinks like kefir, kvass, and kombucha will all work fine! Try some miso or tempeh! 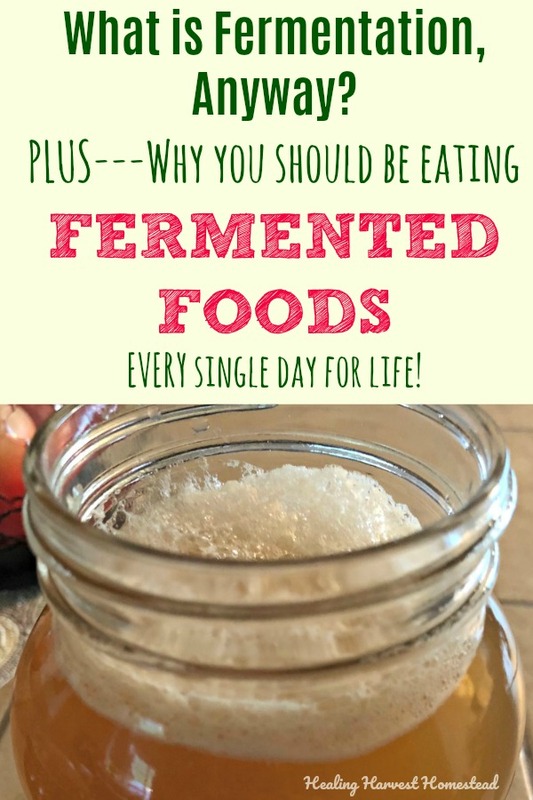 There are actually so many kinds of fermented foods to eat! There are others, but these are the main items that were on all the lists I searched. Personally, I think fermented foods taste delicious, I can easily make them myself, and if I can get these kinds of health benefits from eating them? Great! Sign me up! So, What Exactly is Fermentation, in Easy Language? Let's make this really simple, shall we? Fermentation is the process of breaking down a food into simpler parts. That's it. All the wonderful byproducts and occurrences from fermentation are part of this too, of course, but really that's all fermentation is. If you want to get down to the real nitty gritty, you could even say it's the first step in the decomposition of a substance. Any more of an explanation will put us into a lot of chemistry and teachings on aerobic vs. anaerobic processes, different types of bacteria and yeasts....and I don't think I'll go there. It will take too long and be VERY boring. Check out more information on the internet on these processes---there is tons of it these days! If you try fermenting foods yourself, you will SEE the process happening before your very eyes. It's pretty exciting to see those little bubbles at the top of a healthy ferment! 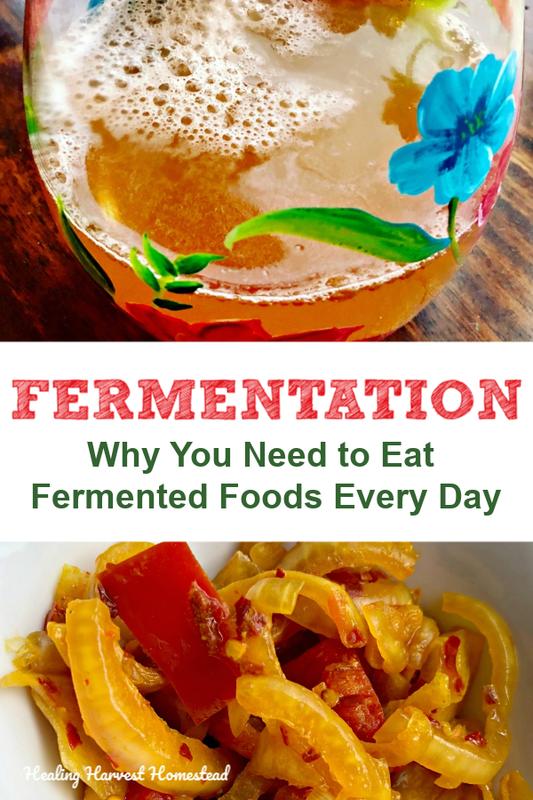 I am a simple enough person to just have experienced the benefits of fermentation, tried lots of different fermented foods (and made my own), and given this simple definition---I'm good. I know it happens in different ways, depending on the foods, the specific bacteria/yeast structure of the culture, and the environment. And I'm happy with that. If you want an excellent resource that will tell you literally everything you want to know about fermentation, please purchase The Art of Fermentation, by Sandor Katz. It's a truly amazing resource with science-based information. It's pretty all-encompassing, too. Here is some fermented hot sauce! This stuff is so delicious, it lasts a very long time, and it costs hardly anything to make. Guess what? My gut is going away. I can't say if it's due to eating lots of different probiotics through many kinds of fermented foods every day, or maybe it's because I've mainly cut out all grains and added sugars and say absolutely NO to processed foods. But what I CAN tell you is that my tummy is shrinking! And I'm REALLY happy about that! NOTE: Eating fermented foods is not an option for some folks, yet getting a good ratio of probiotics is still necessary. If, for some reason, you don't want to or can't make or purchase raw fermented foods, here is a great Probiotic option I found you can take as a supplement: Women's Care Probiotic. How to Make Herbal Kombucha...and there are a lot more! Leave questions, comments, and ideas in the comments section—I love to hear from you! P.S. If you haven't done so yet, I hope you will subscribe to our newsletter and get immediate access to the Resource Library. The Library is a growing collection of resources for you in your journey to self-reliance. One of my favorites is the mini-eBook, How to Herbs to Relax, filled with great recipes and remedies! Katz, Sandor E.; The Art of Fermentation, an In-Depth Exploration of Essential Concepts and Processes from Around the World; copyright 2012; Chelsea-Green. pp 21-30. I am NOT a medical professional. The information presented in this article, elsewhere on my website, and in any products I make are for informational purposes only and are simply my own opinion based on research, study, and years of experience. Please seek medical advice from a health professional. In no manner is any statement made by me here or elsewhere meant or implied to treat, diagnose, cure, or prevent any medical condition. These statements have not been evaluated by the FDA. This article has been shared at The Homestead Blog Hop!